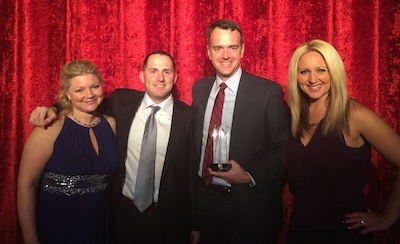 NEW YORK, NEW YORK--Recruitics, a marketing analytics and automation platform for direct employers, staffing companies, and job boards, was named "Most Innovative Enterprise Solution" at the 2015 Recruiting Service Innovation Awards (ReSIs) this past weekend at a gala awards ceremony in Las Vegas, NV. The ReSIs are designed to recognize the individuals, organizations, products and services that are having a significant and beneficial impact on talent acquisition. Recruitics was founded in 2013 with the mission of making it easy for companies to understand and optimize their recruitment marketing strategy. The company built the first programmatic ad buying platform for the recruitment industry, which allows companies to optimize their return on investment on pay-per-click (PPC) job ads for over 30 leading recruitment websites to include Indeed, ZipRecruiter, Simply Hired, and Jobs2Careers. Recruitics pairs its PPC job optimization platform with the most comprehensive analytics offering in the market to track recruitment marketing success. This powerful reporting suite gives clients the ability to track performance at the job-level to include source data, spend, conversion rate, and cost-per-click / applicant, allowing them to make more efficient data-driven decisions around their talent acquisition process and improve ROI. "Everything we do at Recruitics centers around helping companies find great talent," said Ken Clark, CEO of Recruitics. "We thank the ReSIs committee for recognizing the innovation and contribution Recruitics is making within the talent acquisition process. We look forward to continuing to revolutionize the way that companies manage their online recruitment marketing strategies in the coming years." The ReSIs are conducted by the International Association of Employment Web Sites (IAEWS), the trade association for the global talent acquisition solutions industry. Participation in the competition is open to all organizations worldwide that operate in that industry. You can find Recruitics next at Staffing World 2015, hosted by the American Staffing Association, on October 27-29 at Booth #1018. Recruitics is an analytics and automation platform that makes it easy for companies to achieve amazing results from their recruitment marketing strategy. Founded in 2013, Recruitics works with the nation's largest corporations, staffing agencies, and job boards to drive more applicants to their online job postings, hire great talent, and meet their recruitment goals. Recruitics also partners with many of the leading ATS systems in the US to include iCims, Kenexa, HealthcareSource, and Greenhouse, to provide seamless integration and tracking. The company is headquartered in New York City, NY and is privately owned and operated. You can find Recruitics online at http://recruitics.com/.